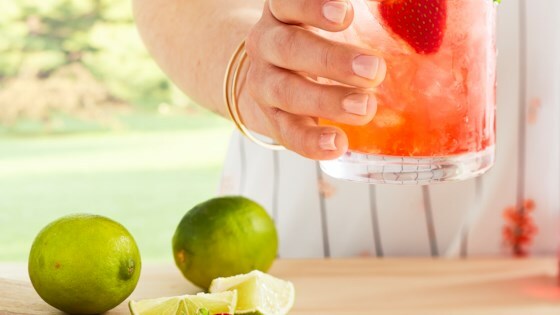 "Strawberry syrup adds a delicious fruity twist to the lime and mint base of this refreshing summertime favorite." Juice 4 limes, yielding about 1/2 cup juice, and cut remaining lime into 6 wedges. Grasp mint sprig stems and slap leaves against a work surface to help release their oil; transfer to a sturdy glass pitcher. Stir in lime juice, rum, and strawberry syrup. Add club soda. Spread 1/4 to 1/2 inch sugar on a small, shallow plate. Run a lime wedge around the rim of each glass, then dip glass into sugar. Fill with ice. Pour in mojito mixture. Garnish with mint sprigs and strawberries.